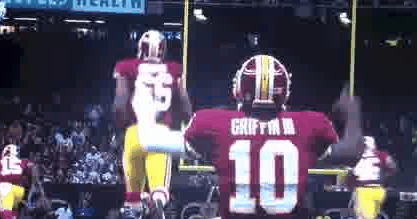 RG3Skins: Griffining Vs Stop Griffining: Who Ya Got? Griffining Vs Stop Griffining: Who Ya Got? After Robert Griffin III's first touchdown pass of the season, the rookie QB was knocked to the ground where he sat watching Pierre Garcon run 88 yards for the touchdown. As he sat on the turf, he put his two arms up in the air and pointed to the sky. Griffining was born. In the following few days, people began taking pictures of themselves in the same pose that RG3 was in. (See the play in this GIF). Soon after, this was coined "Griffining" (I think by Burgundy Blog, but not exactly sure) A twitter name @Griffining was quickly swooped up and their follower count grew. Of course, not everyone loves Griffining. There was a clear opposition to this fad on Twitter. Hundreds of people were sick of this quickly and wanted everyone to get back to football. A @StopGriffining Twitter name was created and Anti-Griffining had begun. So which side of this are you on? 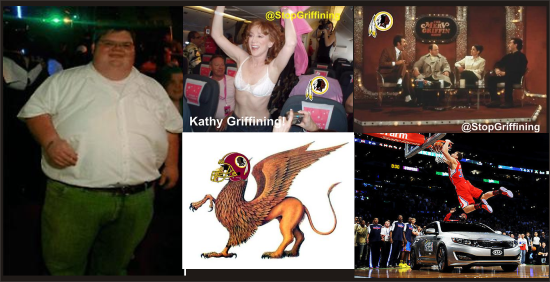 Do you think that Griffining is fun and a good thing for the Redskins? Do you think that it is a stupid fad that makes the Redskins and RG3 look silly? Vote! To Griffining or Not To Griffining?